Ever since my early years, I have been a huge fan of camping and adventure. From trips to designated (paid) campgrounds, hanging on a backpack, to pitching tents on a mountainside. Yes, I’ve been on quite a number of boondocking trips too. But basically, one question that keeps stirring up concerns for campers is where is boondocking legal? I have been in such a position too. Trying to find the best place to go boondocking without getting into any kind of issues of trespassing. That is why I have taken my time to write this post and I hope you find it helpful. Legal boondocking sites typically are all about free public lands. Your best options are the public lands around you. These government designated sites such as national forests from National Forest Service and other campsites by the Bureau of Land Management. Boondocking – Where Is It Legal? Actually, is it legal in the first place? How can it be legal and free? Let’s be realistic if it wasn’t legal most people probably wouldn’t get involved with it. Because they think they will be walking down the path of a crime. More so, there will be no governing body responsible for it. That being said, where is boondocking legal? Most legal boondocking sites are farther out in nature. There are designated camping areas set aside for boondocking by the authorities. You just have to be in the know of where these places are. Legal boondocking sites typically are all about free public lands. Your best options are the public lands around you. These government designated sites such as national forests from National Forest Service and other campsites by the Bureau of Land Management are available all across the nation. There are quite a number of camp locator websites that provide you with up-to-date locations of free sites. These can tell you where you can go boondocking. Some, however, may be wrong with some of their information. So typically, your best bet would be is to make a contact with any public lands office near you. And of course, you can look out for bloggers like us who would share some of our best and favorite locations. Like places where we have gone boondocking and maybe including some helpful tips too! Oh well, if you are pretty new to camping, no worries. 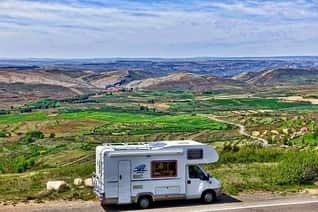 I am sure you must be wondering what boondocking is and how it’s different from camping on a campsite. Perhaps you have come across one or more of these terms – free camping, dry camping, off the grid camping. Or wild camping especially among campers, dispersed camping is what most government agencies call it. Boondocking entails camping in an undeveloped area, or a wilderness type of environment so to say without hookups. Simply put a type of camping done in a secluded area where there are no facilities available for use. These are things like electricity, sewer, water, and garbage disposal. You are just living off all you have in your RV system and supplies that you have brought along. Boondocking spells countless adventures in big bold letters. When you go boondocking, you get to explore the most serene, mind-blowing and picturesque places nature has to offer. You get to camp all for a low or insignificant price to a “no fee price”. In fact, it’s all about driving into the wild and camping out in the hinterlands somewhere. This is a great way to disconnect from the rest of the world and also to connect with nature. This way you can get overwhelmed and save a lot of money while doing it. Why would anyone decide to go boondocking, where they don’t get the essential facilities? Most people I say, are looking for the quest for adventure! Getting on the road, and experiencing the loner life of living. Places that are free from loud noises in busy cities, and free from the traffic. They are trying to go where the only sound heard is nature. And really, while some people like to go boondocking on vacations, or weekend getaways. Others are so tied to finding grand adventures that they decide to take on boondocking as a lifestyle. Some people love going for years from one scenic location to another. How do I go about looking for legal boondocking sites? Here’s the deal – For boondocking, the options are so numerous. There are some unofficial locations where you can go boondocking without issues. It is best to go for officially recognized locations, that may not be well known and as such will provide you with so much solitude. Here are a few suggestions of where you can find legal sites for boondocking. In the United States, the BLM oversees over 245million acres of public land. This land mass is mostly characterized by forest, grassland, high mountain, desert places, lakesides and lots more. You can avail some of the best legal boondocking sites with the BLM. Most of the sites provided, however, usually comes with a camping limit after which you must move outside a 25mile radius. The US forest service manages grasslands and forests all across the states. All the land combined amounts to over 193 million acres of land. There is a dispersed camping limit of 14 days, but this varies depending on the location of forest or grassland. Within your state, there are mind-blowing public land areas and forest areas where boondocking is allowed. Contact the state public land authorities near you to be sure you are not trespassing. Ever heard of this term? These are certain locations where campers are allowed to boondocks for months anywhere they wish, whether on the same spot or moving across the designated LTVA site. The US Fish and Wildlife service oversee thousands of wildlife refuge and wetlands. Some of which are open for boondocking. You will find a great campsite that might even present you close proximity to water. Boondocking as much as it sounds so simple, is just camping in the boonies. It sure does require thoughtful planning! You will be in the best hands if you have a few tips under your belt that will help you every step of the way! Be sure to explore the area where you are going to boondock and look out for areas where people have camped in the past. Do you want to go boondocking for a few days? The chances are your self-contained RV would come with the much-needed essentials. Things from fresh water holding tanks, to waste water tanks, a coach battery that will carry you through. If you want to go longer than a few days, you should consider adding a generator to your list. Going on for months? Here’s where an inverter, solar electrical systems, large battery bank, large fresh water, and wastewater tanks will come in handy. Actually, the question to ask is. Is it safe to live on public land rather than in a busy upscale city? I’m sure public lands will spell less trouble for you of course. It doesn’t make sense for a criminal to drive out miles away from the city. Then down dusty bumpy roads that lead to the middle of nowhere where. Then try to steal from an RVR who probably has just a couple of supplies with him. But for me, I will say that safety is relative. It depends on how we look at safety and how we address certain matters. When we are set out to do something, chances are there might be some downsides as opposed to the desired positive results. But the best thing to do is stay fixed on positivity. So if you are going boondocking, it is advised to stay in the best state of mind. Remember that you are safe but guard and protect yourself if you feel it’s necessary. Wanna go with a gun? My thoughts, if it makes you feel safe then go for it. But be sure to have a license for the gun. And you should check and see if it is legal where you are at. Scared of being attacked by wild animals, oh well, the chances of that are so slim. Most of these animals like bears, cougars, moose, and buffalo are usually somewhere in the national parks. But I will advise you stay aware of your environment and where you are at. The most animals you will normally see are deer, jack rabbits, chipmunks, squirrels, donkeys, sheep, and cows. Never Tried Boondocking How Do I Know It’s Right For Me? If you like the company of people and feel your fun is incomplete without having neighbors around. Then a campground may just be your best bet. Do you enjoy getting lost in outdoor peace and quiet while basking in the beauty of nature’s serenity? Then you will find that nothing beats boondocking! Little wonder it’s the favorite of most RVers. Just like the saying goes New York bagels, once you try them you will be hooked. Boondocking try it and you will be in no doubt that boondocking is the paragon of camping! Get off that boring roller coaster ride and get on to trying out some boondocking!